Sister machinist unions, San Francisco's Lodge 68 of the International Association of Machinists and Oakland's Local 1304 of the CIO's Steel Workers Organizing Committee (which left the IAM over a wildcat strike in 1936), had a national reputation for militancy; Lodge 68 had more strikes during World War II than all other Bay Area unions combined. Along with Local 1304, they accrued this strike record in open defiance of the National War Labor Board, who were backed by the FBI, the Office of Economic Stabilization in the White House, a Navy Vice-Admiral, the War Manpower Commission, the collective bosses, who in turn were supported by the CIO, ILWU, and Communist Party. These actions were a part of one of the harshest set of federal government measures employed against any group of American workers during World War II. Pursuant to two executive orders by President Roosevelt in September 1944, the U.S. Navy took possession of the bulk of the machinery industry in San Francisco and the industrial suburbs south of the city. The existing multiemployer contract was suspended, as were collective bargaining rights, union recognition, dues payment, the hiring hall, and the right of union representation. Joos and Burke were fired and blacklisted “for the duration” of the war. Others were referred to the Selective Service System for immediate drafting into the armed forces. Others had their ration cards for food and gas revoked. A large number of FBI agents fanned out through the working-class community, visiting and interviewing thousands of machinists in their homes. There was talk that the union leaders would be prosecuted under new federal and antistrike legislation.2 What led up to these events, and what were some of their consequences? During the 1930s, the machinists were again prominent in the revival of unionism and in radical opposition to national union leadership. 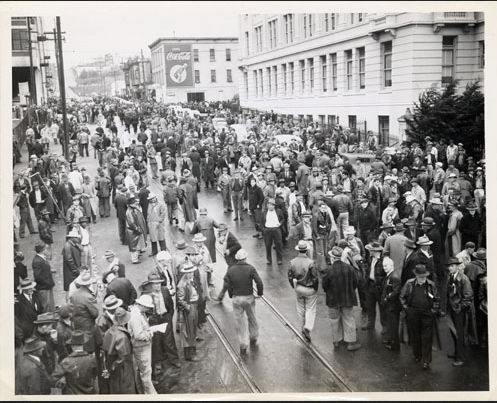 In 1934, during the epochal unionization struggle of West Coast waterfront workers, the San Francisco machinists were the first of the old, established craft unions to push the idea of a general strike.8 In 1936, the machinists defied their international union against the imposition of a low-paid “production worker” job classification. When the international union attempted to break a major strike over the issue, the Oakland machinists withdrew from the International Association of Machinists (IAM) and joined the Congress of Industrial Organizations’ (CIO) Steel Workers Organizing Committee.9 As a result, Lodge 68 and the new Steel Workers’ Local 1304, which continued to work closely together despite interfederation warfare, may have been the first AFL-CIO in the country. The machinists were different. They had grievances, a militant tradition, and rigorously democratic internal governance. Moreover, they had a large core of activists and an experienced and determined leadership. The outstanding leaders were Edward F. Dillon and Harry Hook, business agents of Lodge 68, and James P. (“Turkeyneck”) Smith of Local 1304. In the cases of Martin Joos and Arthur Burke, we can see a dauntingly complex set of forces and events resulting in what was ultimately an ineffectual victimization of these union activists. First, the machinists were a compact group of skilled workers with powerful traditions and interests they perceived to be seriously threatened. They proved ready to challenge their employers and, if need be, the U.S. government. Second were major employers, intent on curbing labor’s power precisely in the arena where the machinists excelled: job control on the shop floor. Third was the government, which proved to be internally divided and slow to act. NWLB to wrest concessions from management. The machinists threatened this position, both because they seemed oblivious to the political danger of backlash and, more importantly, because they posed an implied alternative leadership strategy to that of the moderates. Galvanizing opposition to the machinists within the labor movement was the Communist party.35 Under Hook and Dillon, its former allies in the progressive wing of the labor movement, the machinists’ union had become a major threat to the party’s goal of promoting labor peace and “national unity” in the cause of Allied victory.36 The conflict between the Communist party and the machinists’ union would continue into the postwar period, with tragic consequences. Edward Dillon’s prophesy came true: the end of the war in the fall of 1945 saw the machinists confront the employers “the old fashioned way.” They walked off their jobs in shipyards and machine shops in San Francisco and Oakland, demanding, like the auto workers who struck against General Motors three weeks later, a 30 percent wage increase. Although 12,000 machinists struck, some 45,000 nonstriking members of other metal craft unions honored the picket lines.37 However, the strike divided the labor movement: union officials, including ILWU leaders, attacked the strike and undermined it behind the scenes. Because of this lack of official union support, 45,000 nonstrikers received no strike benefits. 1. Jack H. Sapiro (IAM Lodge 68 attorney) in Transcript of Appeal Hearing, case of Martin Joos, October 9, 1944, Appeals Cases, Region XII, Records of the War Manpower Commission, RG 211, National Archives – Pacific Sierra Region, San Bruno, California (hereafter cited as Joos Trans., WMC XII, NA-Pac. Sierra). 2. San Francisco Chronicle, August 17, 1944; Harold G. Bowen, Ships, Machinery, and Mossbacks: The Autobiography of a Naval Engineer (Princeton, NJ. : Princeton University Press, 1954), pp. 285-89; Edward F. Dillon to Harvey W. Brown (IAM International President), September 3, 1944, in Lodge 68 File, International President’s Files, International Association of Machinists Papers (microfilm), Wisconsin State Historical Society, Madison, Wisconsin (hereafter cited as IAM Papers). 3. San Francisco Call Bulletin, March 7, 1947; Katherine Archibald, Wartime Shipyard: A Study in Social Disunity (Berkeley: University of California Press, 1948), p.142. 4. David Montgomery, Workers’ Control in America: Studies in Work, Technology, and Labor Struggles (New York: Cambridge University Press, 1979); Jeffrey Haydu, “Factory Politics in the British and American Metal Trades: Changing Agenda for Protest, 1890-1922” (Ph.D. diss., University of California at Berkeley, 1984); Ronald Schatz, The Electrical Workers: A History of Labor at General Electric and Westinghouse, 1923-60 (Urbana: University of Illinois Press, 1983). 5. Nelson Lichtenstein, Labor’s War at Home: The CIO in World War II (New York: Cambridge University Press, 1982); Howell John Harris, The Right to Manage: Industrial Relations Policies of American Business in the 1940s (Madison: University of Wisconsin Press, 1982). 6. Ira B. Cross, “Machinists’ Local 68,” handwritten notes, October-November1914, Folder 51, Carton II, Cross Collection, Bancroft Library, University of California, Berkeley. 7. Delegate Carberry (Lodge 68), 1920 IAM Convention Proceedings, p. 226; Louis Goldblatt (member Tenth Regional War Labor Board and vice-president of the Longshoremen's and Warehousemen's union) in Executive Sessions of the National War Labor Board (hereafter cited as Exec. Sess. ), June 2, 1944, p. 427. 8. Levon Mosgofian interview, March 30, 1984; Lodge 68 Minutes, June 13 and 20, 1934, in custody of IAM Local 1327, Oakland, California. 9. Harvey Brown to George Adams (Lodge 284), July 14, 1936; Walter Galenson, The CIO Challenge to the AFL: A History of the American Labor Movement, 1935-41 (Cambridge, Mass. : Harvard University Press, 1960), pp. 502-4. 10. Horace Drury, History of Shipbuilding Stabilization: A Study of Industrial Relations in a Key War Industry: Part II, Stabilization in the Framework of National Defense (typescript, Office of Defense Management, Washington, D.C., 1954), pp. 207-22, copy in RG 254, Records of the Shipbuilding Stabilization Committee, National Archives. 11. Lichtenstein, Labor’s War at Home, pp. 119-20; Levon Mosgofian interview, February 2,1984; Ralph Miller interview, October 6,1985. 12. Daily Worker, March 3, 1942; Harry Bridges, Longshoremen’s Bulletin (ILWU Local 10, San Francisco, California), March 10, 1942. 14. For example, there were at least 30 longshore job actions on the San Francisco waterfront during the war, none of them sanctioned by union officials. Minutes of Joint ILWU-Waterfront Employers Association Labor Relations Committee, San Francisco, California, in Local 10, May 10, September 8 and 18, 1942, and passim. 15. Harris, The Right to Manage, p. 47; “Wages: Squaring the Vicious Circle,” Fortune 27 (May 1943): 88; Melvyn Dubofsky and Warren Van Tine, John L. Lewis: A Biography (New York: New York Times Books, 1977), pp. 418-19; Lichtenstein, Labor’s War at Home, pp. 150, 159; Art Preis, Labor’s Giant Step: Twenty Years of the CIO (New York: Pioneer, 1966), p. 161. 16. Sidney Hillman to Metal Trades Councils and Shipbuilding Employers of the West Coast, March 25, 1942, in San Francisco Machinists Locals 68 and 1304 file, file code 37/3, Subject Classified Central Files, Records of the Shipbuilding Stabilization Committee, RG 254, National Archives; Frank Knox (Secretary of the Navy to all District Commandants, March 25, 1942, in San Francisco Bay Area file, file code unknown RG 254; Ralph Bard (Assistant Secretary of the Navy) to Frances Perkins, May 22, 1942, file code 58/544, RG 254. 17. Ralph Miller interview, October 6, 1985; Wayne Morse, NWLB Opinion, January 1, 1943, cited in Sam Kagel, Union’s Opening Brief, pp. 89 ff., in Case 665, Lodge 68 vs. California Metal Trades Association, in Records Relating to Dispute Cases, national War Labor Board Region X, San Francisco, RG 202, in “Charles Kerr Collection,” San Francisco Labor Archives and Research Center, San Francisco State University. 18. E. F. Dillon to H. W. Brown, January 7, 1944, IAM Papers; Harry Hook and E. F. Dillon to H. W. Brown, April 9, 1944, IAM Papers; Minutes of Special Called Meeting, Lodge 68, March 26, 1944, in Lodge 68 Minutes. 19. E. F. Dillon to H. W. Brown, April 27, 1944, IAM Papers; Dillon, quoted in San Francisco Chronicle, August 3,1944. 20. Dillon to Brown, April 27, 1944, IAM Papers; Fred Hewitt (editor, Machinists Monthly Journal and alternate labor member of the NWLB) in Exec. Sess., May 2, 1944, pp. 186-88; H. W. Brown to William H. Davis (chairman of the NWLB), May 5, 1944, IAM Papers; H. A. Schrader (IAM International) to George W. Lawson (AFL member, NWLB), May 10, 1944, IAM Papers; H. A. Schrader, statement before the NWLB, May 10, 1944, p. 70, IAM Papers; E. F. Dillon to H. W. Brown, April 27, 1944, IAM Papers; Lloyd Garrison (public member, NWLB), in Exec. Sess., May 10, 1944, p. 325. 21. Lodge 68 Resolution, April 26, 1944, in Lodge 68 Minutes; Mr. Keezer in Exec. Sess., May 10, 1944, p. 306; J. H. Sapiro (Lodge 68 attorney) in NWLB hearing, May 10, 1944, p. 18; San Francisco Chronicle, May 7, 1944. 22. Thomas F. Neblett (chairman, NWLB Region X, San Francisco) to Lodge 68, telegram announcing directive order, April 20, 1944; the union enforced a ban on overtime at Union Iron Works in the 19308. Lodge 68 Membership Minutes, April 1, 1936; Lewis Gill (public member, NWLB) in Exec. Sess., May 2, 1944, p. 202; George Taylor (public member, NWLB) in Exec. Sess., May 31, 1944, p. 100; Vinson, quoted in Bowen, Ships, Machinery, and Mossbacks, p. 283. 23. Aubrey Grossman to Lee Pressman, October 28, 1944, in Pipefitters’ Local590 File, Papers of Gladstein, Leonard, Patsy, and Anderson, Bancroft Library, University of California, Berkeley. Exec. Sess., June 2, 1944, pp. 397-98. 24. Exec. Sess., June 2, 1944, pp. 397-98. 26. Lloyd Garrison in Exec. Sess., June 2, 1944, pp. 363-64; Lewis Gill in Exec. Sess., June 2, 1944, pp. 48, 366; and New York Times, July 9, 1944. 27. New York Times, August 1 and 22, 1944; San Francisco Chronicle, August 1,2,3, and 4, 1944; E. F. Dillon to Harvey W. Brown, September 3, 1944, IAM Papers. 28. Bowen, Ships, Machinery, and Mossbacks, pp. 282,284,305, and passim; Dillon to Brown, September 3, 1944. 28. Bowen, Ships, Machinery. and Mossbacks, pp. 282,284,305, and passim; Dillon to Brown, September 3, 1944. 29. New York Times, August 16, 1944; San Francisco Chronicle, August 19 and 20, 1944; Garrison in Exec. Sess., August 18, 1944, p. 596, and Lt Barrett (USN), in Exec. Sess., August 18, 1944, pp. 623; San Francisco Chronicle, August 18 and September 3, 1944; Bowen, Ships, Machinery, and Mossbacks, p. 299; San Francisco Chronicle, August 27,1944. 30. Anthony O’Brien (War Manpower Commission, San Francisco office) in telephone conversation with Bernice Lotwin (War Manpower Commission, Washington, D.C.), September 15, 1944, verbatim transcript, Arthur Burke file, Appeals Cases, Region XII, Records of the War Manpower Commission, Record Group 211, NA-Pac. Sierra (hereafter cited as WMC XII); Bowen, Ships, Machinery, and Mossbacks, p. 285; K. C. Apperson to Roy Brown, August 31, 1944, IAM Papers. 31. Ibid. ; Dillon to Brown, September 3, 1944, IAM Papers; Bowen, Ships, Machinery, and Mossbacks, p. 303; Dillon to Brown, September 3, 1944, IAM Papers; San Francisco Chronicle, September 14, 1944. 32. O’Brien to Lotwin, WMC XII; Statement of William A. Edwards, late August-early September 1944(? ), File 663, ACLU of Northern California Papers, California Historical Society; O’Brien to Lotwin, WMC XII. 33. J. H. Sapiro, Brief of October 16, 1944, pp. 6-7, in San Francisco Lodge 68,International Association of Machinists vs. Forrestal, et al., Case No. 23721G, U.S. District Court, Northern District of California, RG 21, NA-Pac. Sierra; Paul V. McNutt, “In the Matter of the Appeal of Arthur B. Burke: Chairman’s Findings of Fact and Decision,” p. 10, in File 663, ACLU of Northern California; Lodge 68 Minutes, September 13, 1944. 34. Dillon to Brown, September 3, 1944. 35. For example, at the start of hearings in Washington, D.C., Dillon informed IAM headquarters staff that Goldblatt was lobbying officials of other international unions in the capital against the San Francisco machinists’ cause. E. F. Dillon telegram to Eric Peterson, general vice-president, International Association of Machinists, June 1, 1944, IAM Papers. 36. Harry Bridges, “On the Beam,” ILWU Dispatcher, 1941-46, passim. 37. San Francisco Chronicle, October 30, 1945. 38. The role of the employers is discussed by leading employer representative, Paul St. Sure, in his oral history. According to St. Sure, a committee of major Bay region employers sat the IAM international executive board down in Berkeley’s Claremont Hotel and told them how to place Lodge 68 under receivership and break the strike. “Some comments on Employer Organizations and Collective Bargaining Since 1934. An Interview Conducted by Corine Gilb for the Institute for Industrial Relations Oral History Project” (typescript, University of California at Berkeley, 1957), p. 357. 39. For opposition to strike by the metal trades and the San Francisco Central Labor Council, see San Francisco Chronicle, October 21, 25, and 30, and November 2. 1945; the Communist party’s San Francisco newspaper. People’s World, November 1, 2, and 5. 1945. Dissident elements within the Communist party succeeded in printing their criticisms of the IL WU leaderships’ efforts to undermine the machinists’ strike in the People’s World in the fall of 1945. See Harrison George (author of many of these articles), “Crisis in the CPUSA” (Los Angeles, self-published. 1947). The author’s 1984 interviews with Levon Mosgofian, a prominent rank-and-file Communist machinist who was expelled from the party for supporting the strike and the Lodge 68 leadership, have also been instructive. For Louis Goldblatt’s version of his role in the strike, including the opposition he encountered from the ILWU membership, see his oral history “Louis Goldblatt – Working Class Leader of the ILWU” (Bancroft Library, University of California, Berkeley, 1974), pp. 336-40. Interesting. Might be worth adding where and when this article was published. Switched to Full HTML so the footnotes are working. Peter, it says at the bottom. EDIT: IDP was right before, at some point the option to preview articles one is submitting and see it all was lost. It does make it difficult or at least more annoying to put stuff on here that requires formatting. I don't think the attribution was there before, but if so I apologise for my selective blindness. This is such an important history because it exposes the treacherous class betrayal of ILWU bureaucrats, which began as early as World War II. Communist Party influenced unions, most of which were in the CIO, were the strictest enforcers of the no-strike pledge during the war -- prioritizing toeing the Moscow line over working class solidarity. So during the strike wave during and after the war, the rank-and-file of AFL unions were usually at the center of the most militant actions -- fomenting wildcat and general strikes (4,985 of the former and 6 citywide versions of the latter in 1946 alone). Bridges wanted the ILWU to have a 9-year contract after the war, which he'd hoped would have a no-strike clause. The militancy of the longshore rank-and-file prevented that until much later. Boyden was a good friend of Stan Weir and wrote an unpublished 55-page account of the 1946 Oakland General Strike (I'm trying to get his permission to post it here on libcom). Boyden interviewed Stan extensively, but also had talked to several of the Stormy Petrel machinists in completing his 1988 PhD. dissertation entitled The San Francisco Machinists from Depression to Cold War, 1930-1950. The legacy of militants and radicals in sister IAM Lodge 68 in San Francisco and SWOC Local 1304 in Oakland puts them clearly in the "Chicago Idea" tradition. According to Boyden, Lodge 68 militant Edward F. Dillon had come out of the "syndicalist hothouse of Chicago," so the connection to the tradition was literal, as it was with earlier Lodge 68 member Edward D. Nolan who was a former Wobbly as well as having been close to Tom Mooney and Warren Billings, the anarchists framed for the Preparedness Day bombing in San Francisco in 1916 that killed 10. Boyden's dissertation reads like a novel and it's such an inspiring tale of shopfloor militancy, class consciousness and acts of solidarity. He mentions machinists in the 1930s who bragged that a picket line in Oakland was "more effective than a barb wire fence." At the end, Boyden also makes the case that the anger over the defeat of the 5-month machinists strike in the fall of 1945 was still remembered over a year later, in December 1946, and the rage over the crushing of the Stormy Petrels was one of the catalysts of the Oakland General Strike. Long live Ed Dillon, Harry Hook and Turkeyneck Smith! It is also worth noting that at the very moment that the SF machine shops were occupied by the US Navy, the founding United Nations conference was going on in San Francisco! Imagine the U.S. delegates going on about defeating fascism and upholding democracy when armed soldiers were posted at the machine shops trying to force the machinists to work overtime! Curious how craft oriented the Local Lodge was at the time.